The Violin Concerto No. 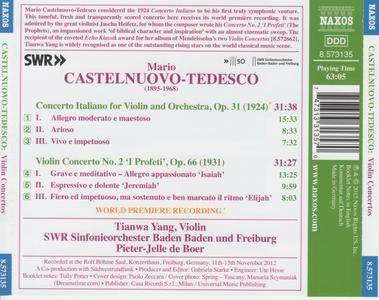 2 ("The Prophets") by Mario Castelnuovo-Tedesco is rarely played, and the Concerto Italiano of 1924 here receives its world premiere on recordings. 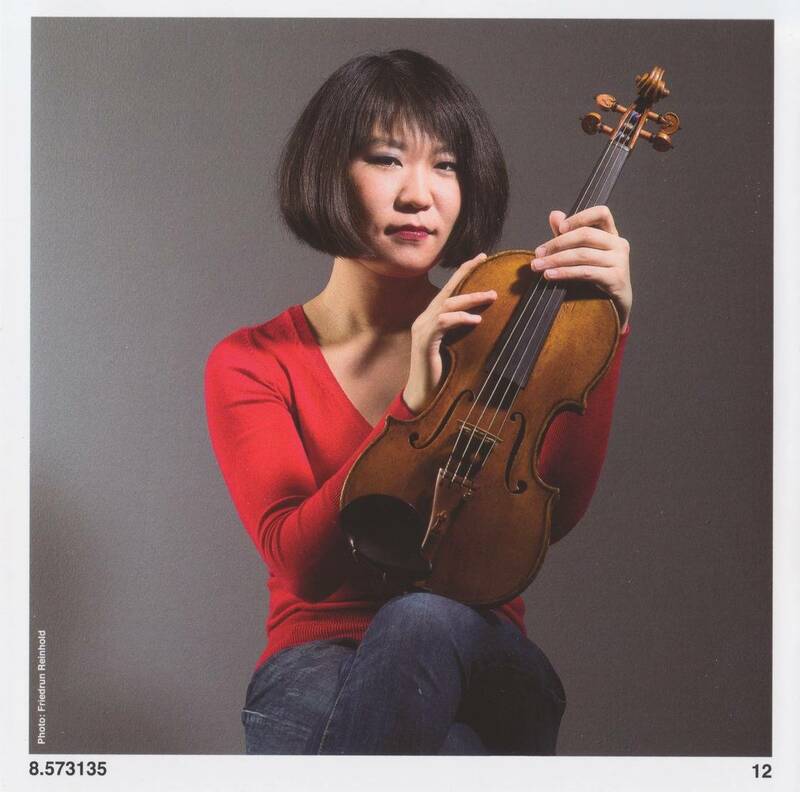 Chinese violinist Tianwa Yang makes a good case that both should be heard more often. Castelnuovo-Tedesco termed the Concerto Italiano "almost Vivaldian," largely on the strength of the crystalline middle movement; the first movement is a big piece of Romantic heroics. Yang offers some real depth in the slow-movement melody and in the episodic structure of the Violin Concerto No. 2, programmatically depicting Isaiah, Jeremiah, and Elijah. 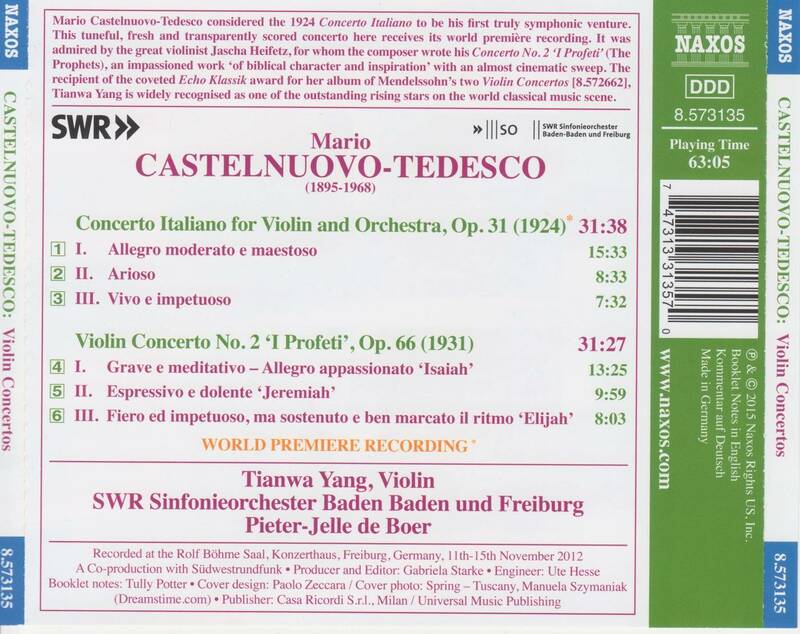 This work, first performed by Jascha Heifetz, anticipates some of the film music the Jewish Castelnuovo-Tedesco was to write after emigrating to the U.S. 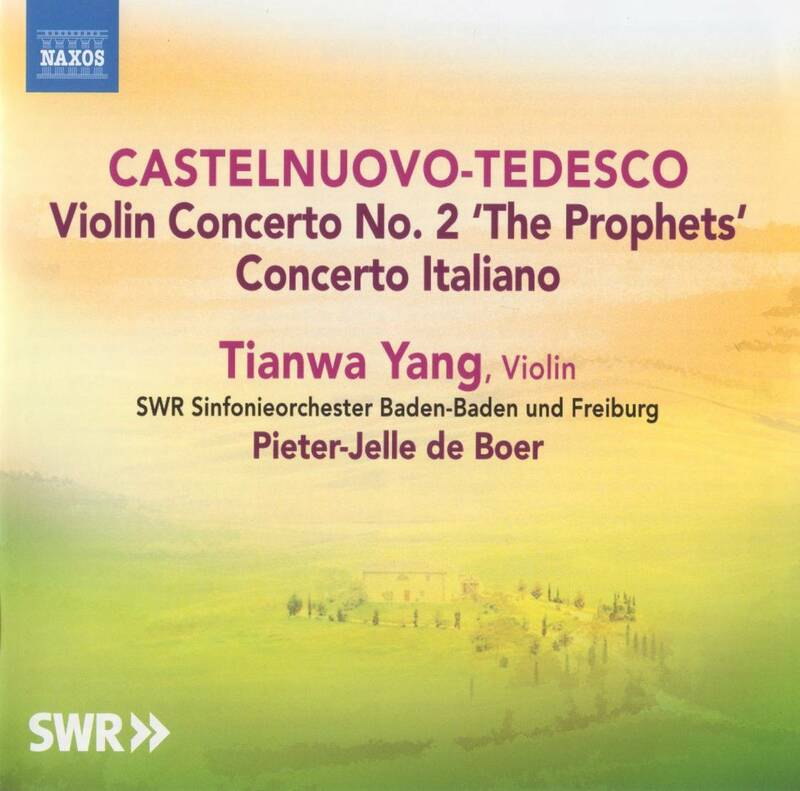 It's a bit like the contemporary violin concerto Ottorino Respighi never wrote (he wrote several in the more antique mode of the Concerto Italiano), but it has a rather restrained Jewish flavor quite unlike the work of Bloch. 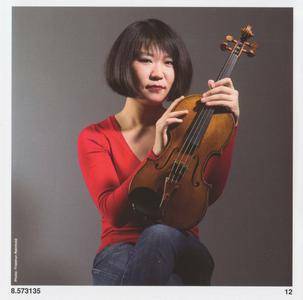 Yang has these difficult works under total control, and her playing has some of the Apollonian quality of Heifetz's; she really holds your attention. Recommended for anyone interested in the national styles of the early 20th century. 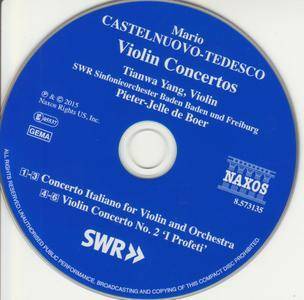 Mario Castelnuovo-Tedesco (1895-1968) was in a couple of ways the Italian counterpart of Austrian composer Erich Wolfgang Korngold (1897-1957. Both were of Jewish descent, and the rise of Nazism along with the outbreak of World War II (1939-45) forced them to leave Europe in the late 1930s. And both would settle in Los Angeles, California, where they'd write film music to support their families, becoming two of Hollywood's most successful composers.